A Developmental Pediatrician is, first and foremost, a pediatrician — A doctor with specialty training in the care of children and certified by the American Board of Pediatrics, who brings a child- and family oriented perspective to the evaluation process. Developmental-Behavioral Pediatrics places a somewhat greater emphasis on psychosocial issues (school phobia, risk-taking behavior in adolescents, gender identity issues, family dysfunction, etc.). The D-BP boards are only available to board-certified pediatricians. The Society for Developmental-Behavioral Pediatrics and the American Academy of Pediatrics are the parent professional bodies for D-B Pediatricians. Doctor Coplan is one of only a handful of physicians holding sub-specialty certification in both Developmental-Behavioral Pediatrics (D-BP) and Neurodevelopmental Disabilities (NDD). Thus, Doctor Coplan is uniquely positioned to explore the entire range of parental concerns. Does my child need to see a Developmental Pediatrician? If you are concerned enough to ask the question, the answer is probably yes. “Wait and see” usually is not the best strategy. Getting a timely evaluation can provide reassurance (if all is well), or can lead to the prompt implementation of services (which will give your child the best opportunity to achieve his or her full potential). How does a Developmental Pediatrician differ from……..
Child Psychologists are capable of performing detailed IQ Testing and Educational Testing – things that Developmental Pediatricians do not do. Child Psychologists often provide ongoing therapy services aimed at helping a child and his or her parents address behavioral, emotional, and/or educational issues. Child Psychologists are not physicians, and cannot perform a physical examination, prescribe medication, or identify underlying medical causes for a developmental or behavioral problem. Child Psychiatrists are physicians who have been trained in the recognition and treatment of severe emotional disturbances in children. Child Psychiatry is an offshoot of Adult Psychiatry; most Child Psychiatrists are not pediatricians. Child Psychiatrists are capable of prescribing medication. Child Neurologists are physicians who have been trained in the recognition and treatment of active or progressive neurological disorders in children (brain tumor, degenerative neurological disorders, hard-to-control seizure disorders, etc.). 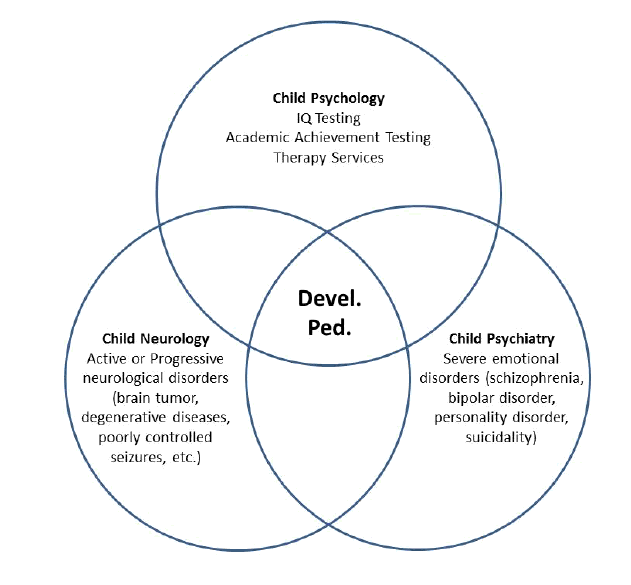 Child Neurology is an offshoot of Adult Neurology; most Child Neurologists are not pediatricians (although some Child Neurologists have sub-specialty training in Neurodevelopmental Disabilities). Developmental Pediatricians (either Developmental-Behavioral Pediatricians or Neurodevelopmental Pediatricians) can perform neurological examinations, interpret the results of psychological testing (as well as the results of testing by other specialists such as OT’s, PT’s and Speech-Language Pathologists), prescribe medication, oversee the medical evaluation of developmental disabilities, and serve as long-term members of a child’s care team. The ability to synthesize information from multiple sources, and the ability to provide comprehensive follow-up of developmental issues, are hallmarks of Developmental Pediatrics.